One of the simplest but most fun exercises that I do when I run programmes for students is the Marshmallow experiment. I have provided this kids as young as 10 right up to 18-year-old students. Most of us know the experiment by now. The original experiment that took place in Stanford University in 1968 by Walter Mischel placed children in a room with a single marshmallow. The children were told by the person conducting the activity that they would return in 15 minutes and if the single marshmallow has remained uneaten then the child would receive a second marshmallow. Ten minutes alone with one of your favourite treats is a long time as a child and it is not a surprise to discover that two-thirds of the children eat the marshmallow thus forfeiting the chance of a second one. Although it was also discovered that if Children were instructed to think of the treat in front of them as a fluffy cloud like object or to think about salty pretzels rather than what was in front of them the desire to eat the marshmallow would be delayed. The experiment we know did not end there. Researchers followed up on the children almost 20 years on and discovered that delayed gratification resulted in greater SAT scores in schools and over all greater competencies in life. I do a similar experiment by leaving the marshmallow on the desk in front of the child and continue with class. Those who make it through the class gain a second marshmallow. To me it is a fun and interesting experiment. I never mention the pretext to why I have done this. It is just a fun and interesting aside to learning about positive mental health. Kids simply like marshmallows! 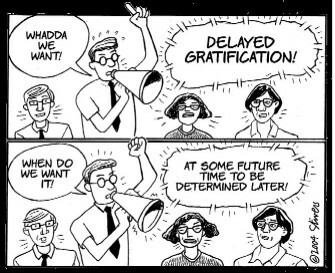 But on a more serious note it seems that there is greater consequences from lack of delayed gratification. And then, of course, there are the vastly different philosophies of child-rearing in the United States and France. These divergent philosophies could account for why French children are generally better-behaved than their American counterparts. Pamela Druckerman highlights the divergent parenting styles in her recent book, Bringing up Bébé. I believe her insights are relevant to a discussion of why French children are not diagnosed with ADHD in anything like the numbers we are seeing in the United States. French parents, Druckerman observes, love their children just as much as American parents. They give them piano lessons, take them to sportspractice, and encourage them to make the most of their talents. But French parents have a different philosophy of discipline. Consistently enforced limits, in the French view, make children feel safe and secure. Clear limits, they believe, actually make a child feel happier and safer—something that is congruent with my own experience as both a therapist and a parent. Finally, French parents believe that hearing the word “no” rescues children from the “tyranny of their own desires.” And spanking, when used judiciously, is not considered child abuse in France. (Author’s note: I am not personally in favor of spanking children). As a therapist who works with children, it makes perfect sense to me that French children don’t need medications to control their behavior because they learn self-control early in their lives. The children grow up in families in which the rules are well-understood, and a clear family hierarchy is firmly in place. In French families, as Druckerman describes them, parents are firmly in charge of their kids—instead of the American family style, in which the situation is all too often vice versa. I am not going to enter the world of arguments about this article but we can see that ultimately delaying gratification for our children from a young age can build a more resilient, patient, accepting and grateful adult. We know that gratitude works we know it lowers our blood pressure, increases happiness by up to 25%, creates greater sleep patterns and increases the likelihood of exercise. But in a world of with very little chance of delayed gratification we find it harder to know what we to be grateful for when everything is available on tap all the time. When we create a society that has never understood what it is to not have. Where Parents provide anything for their children no matter what the cost. Have you ever witnessed the actions of a Child who has experienced getting what they want for the formative years of their lives suddenly hearing a refusal for a request for sweets at a supermarket checkout from a parent who thinks enough is enough. Are we creating a society that will struggle to cope when adversity knocks on their door in later life because we have no reference points to understand what it is not to have. Delayed gratification creates value in what we do not presently have,or for what we are about to receive.It is simply good parenting. Educating our children where our food comes from can create an understanding that it took more than walking to the supermarket to put this food on your table. Save treats for weekends or special occasions. That feeling I had on Easter Saturday as a child knowing I could eat all the chocolate the next day that I had stored up in the fridge over my Lenten fast was like winning the keys to the Wonka factory. Learn to say “No” and stick to your guns. Stop buying crap for kids who don’t even know it’s their Birthday or Christmas because they are only two years old.It’s pointless and starts the child on the hedonic treadmill. If you can’t afford something a child needs explain why and if it’s needed tell them what you have to do to or they have to do before they receive it. Nothing should be seen as immediate. Create an eating routine were food is valued. Teach your children to value what they have. Many in this world have nothing and I mean nothing! Let them understand this. Be grateful and enjoy the pleasures of the simple things. ← More people are working from home. Is it the future?